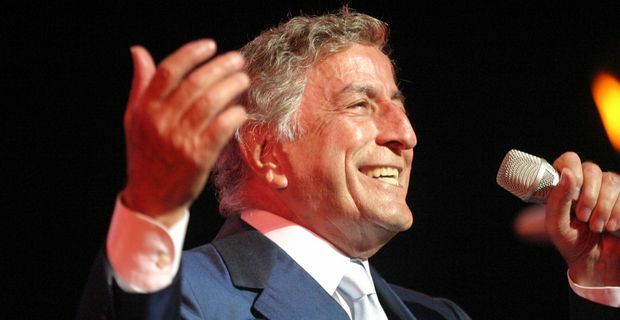 Veteran crooner Tony Bennett has been talking about his collaboration with Lady Gaga, and claiming there might be a chance of recording a whole album with the eccentric chanteuse. The pair recorded a duet of The Lady Is A Tramp on Bennett’s Duets II album released last year. "She's a very talented person," Bennett told Metro. "I was with her parents recently and they said she'd like to make an album with me. I'd like to do that, too. I'm looking forward to it." Gaga’s schedule might preclude anything happening right away, and Bennett isn’t getting any younger, even though he maintains an impressive recording and touring schedule for an 85 year-old. He still performs between 100 and 200 shows a year, insisting, “if you are creative, you get busier as you get older." The Duets album was an inspired commercial decision, featuring collaborations with singers like Aretha Franklin and Michael Buble, as well as a duet with Amy Winehouse on Body And Soul. Bennett was very impressed with Winehouse’s approach to singing. "She was the most talented singer," Bennett said. "She really knew how to sing - she was spontaneous and creative. I couldn't believe it when, a month after we recorded together, my son told me she had died. I wanted to tell her to slow down because she was so good but I never had the opportunity." Bennett begins a UK tour with a show at Birmingham Symphony Hall on June 24. Lady Gaga is in the UK for live dates in September.